The donkey in question was not just any braying, four-legged friend. It was Smoke, the celebrated “veteran” donkey who hee-hawed his way into the hearts of a Fallujah-based Marine battalion in 2008 when he wandered into their camp from the Iraqi hillside. Smoke (whose name reflected his propensity to eat soldier’s cigarettes, both lit and unlit) soon became an unofficial mascot for the squadron, skirting the war zone ban on pets by becoming a certified therapy animal and providing endless entertainment for the soldiers and their children via Skype chats. Eventually, those particularly taken with Smoke went to great lengths to arrange for his transport from Iraq to a therapy farm in Nebraska – a trip that cost more than $18,000 and trekked across more than 6,000 miles for the celebrity burro. Herein lies Oliver’s beef with Smoke. Smoke’s entire visa process took a considerably shorter amount of time (read: months vs. years) than the hoops and hurdles required for Iraqi and Afghan translators attempting to enter the country as part of the Special Immigrant Visa program. While Oliver’s outrage is well-placed and understandable, it’s not difficult to feel a little sorry that Smoke – who passed on to that great pasture in the sky in 2012 – had to take such heat for something far above his equine pay grade. It’s also not a terribly surprising move on the part of Smoke’s higher-ups, given the military’s long, storied love affair with the humble donkey. The donkey’s role as the ultimate gear-carrying companion in military clashes is almost as old as land grabbing, nation-state conflicts themselves. The military’s history of holding the donkey up as a friend and mascot is both well-documented and regularly celebrated. The donkey’s role as the ultimate gear-carrying companion in military clashes is almost as old as land grabbing, nation-state conflicts themselves. The first recorded instance of a heroic military donkey came in 520 BC, according to John Kistler’s Animals in the Military. 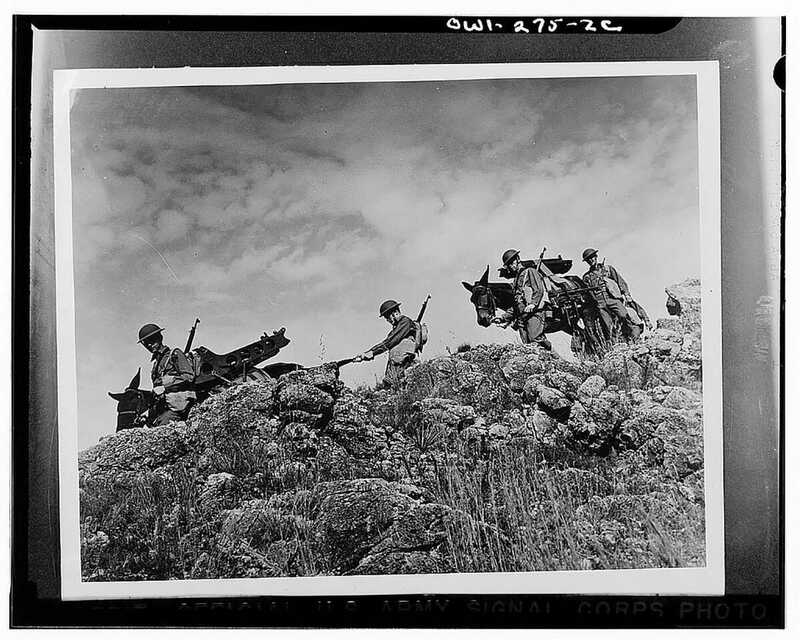 “On at least one occasion, army donkeys … saved an army from destruction,” writes Kistler. “The Scythian cavalry pursued King Darius I of Persia … but the ‘hard braying’ of Persian donkeys upset the Scythian horses. Darius then moved all his donkeys to the rear, and they effectively covered the retreat from the enemy.” The donkey continued to be highly valuable to Roman army officials, who once paid 400,000 sesterces – equal to the combined annual salaries of 400 Roman soldiers – to acquire four, high-quality work donkeys. While primarily used to schlep provisions, the breadth of creative uses for donkeys by military operatives over the centuries has been impressive. During World War I, members of the Australian Army Medical Corps tasked their donkey, Duffy, with a legendary feat during the Battle of Gallipoli in 1915. According to lore, Duffy and his solider-handler – who had worked with donkeys in civilian life – hauled the bodies of 300 injured men out of harm’s way before being gunned down by machine gun fire. One year later, a donkey named Jimmy was born in the trenches of Somme and raised by the British troops on condensed milk and rations. Eventually earning the nickname “The Sergeant” and learning how to salute with one hoof, Jimmy kept spirits high on the front line and carried necessary supplies as his squadron stayed on the move. He was wounded three times during his service, and in 2012 honored posthumously with the PDSA Dickin Medal for bravery – the highest honor that can be bestowed upon an animal by the English military. In the United States, mules eventually became the preferred equine for supply-hauling armies because of their ability to withstand harsher conditions than horses and carry more weight than donkeys. Mules are so deeply rooted in the Army psyche that a pair of the beasts serve as the Army’s mascot, selected in 1899 as a counter to the Navy’s signature goat. The current Army mules – Ranger III and Stryker – are half-brothers and live at West Point, where they are cared for and trained by specially designated cadet Mule Riders tasked with the unique duty of trotting them out at ceremonies and sporting events. The mule might take top Army billing, but the donkey has never plodded along too far behind. The mule might take top Army billing, but the donkey has never plodded along too far behind. The pack animal’s sure-footedness on rocky crags and ability to carry up to a third of its body weight has proven time and again to be beneficial on rough terrain. “A good donkey,” Marines told the Los Angeles Times in 2009, “knows three steps ahead where it wants to walk.” Today, a special subset of military trainees work with both donkeys and mules, as donkeys are far easier to purchase (between $5-7 a head) in current combat zones like Afghanistan. The donkey is also in the throws of a different sort of military second coming – one with a more Terminator-like look to it. Unveiled last fall, the Legged Squad Support System (or LS3) is a robot donkey designed to haul materials like their flesh-and-blood inspirations have done for centuries, only to a mindboggling degree. The LS3 can carry up to 400 pounds while serving as a walking charging station. The latest model is set to be unveiled early next year as part of a $54 million dollar testing program. Whether covered in fur or made out of futuristic metal, it’s hard to imagine any military animal influencing or assisting in the line of duty more than the humble donkey, with the critter adding chapter after chapter to the story of its decorated military service with each passing year. Top: Courtesy Library of Congress Photo Archives.